Wilmington Sharks Fireworks Night 2018 | Sponsored by Salt Air Inc.
Wilmington Sharks Baseball Fireworks Night Sponsored by Salt Air, Inc.
We are so excited to announce that we will be sponsoring our local Wilmington NC minor league baseball team, the Wilmington Sharks, on Friday, June 29th 2018th from 6 PM to 9 PM at Legion Stadium as they take on the Red Wolves of Florence, South Carolina for Sharks Baseball Fireworks Night. For directions to the stadium click here. The fireworks display has been popular with the crowds in years past and we are so excited to jump in full force for the opportunity to give back to members of the community. This game will be sponsored by Salt Air Heating and Cooling, commercial hvac repair Wilmington NC specialists, to promote the local non-profit organization, Wilmington Area Rebuilding Ministry (WARM). Come out to have a good time and learn more about WARM and their mission. Tickets to the game can be purchased in advance online. The full season schedule is available online here. “The whole team here at Salt Air Heating & Cooling has really pulled together and gotten behind one of the community’s most treasured staples and will be cheering on the Wilmington Sharks as they take on the South Carolina Red Wolves in support of an initiative so meaningful to our community and its members.” Devin Skipper, Owner at Salt Air Inc., said: “We are proud to be both associated with the local community and sponsoring the Wilmington Sharks in an endeavor to bring support and awareness to the Wilmington Area Rebuilding Ministry. This will be a perfect chance to get every together for a evening anticipated to be packed full of family, fun, and fellowship. For more information or additional details on the promotion, contact us! Looking forward to seeing you there! About Wilmington Area Rebuilding Ministry, Inc. The mission of WARM is to make people safer in their own homes by organizing volunteers and raising funds to complete urgent repairs and accessibility upgrades, for low-income homeowners. 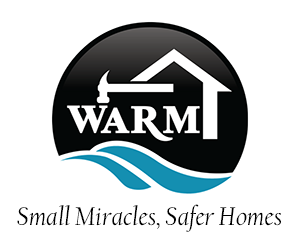 WARM serves homeowners in Brunswick, New Hanover, and Pender Counties.